Experts often say that the most enduring trait of the human species is their relationship with their pets. When you look into Fido’s eyes and he tilts his head a little bit, you know instantly – Dog’s Get It! They know what you want and what you are thinking - and they’re ready to please. Do the same with a cat named Dickens and you find out that the experience is something quite different but just as endearing, as he purrs himself into your heart. To say pets are important in our lives is an understatement. Almost 70 percent of the households in the USA have a pet, and most are either dogs or cats. They are so important in our lives, we often wrap presents for them during the gift-giving season of Christmas and Hanukkah. We love them. Our collection of pet toys and accessories is complete, and you don’t necessarily have to wait for the holiday season. From Harley-Davidson® squeaky toys to leashes, Wisconsin Harley-Davidson® is proud to present these awesome Harley-Davidson® pet toys and accessories! Keep Fido looking great with a cool Harley-Davidson® Bandana while he’s having a blast playing fetch. We even have a Harley® logo pet T-Shirt for Fido, in various sizes depending on the breed. 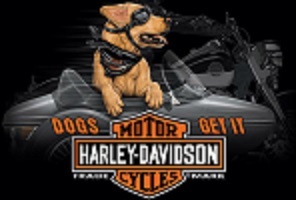 Shop WisconsinHarley.com for cool pet toys and accessories.